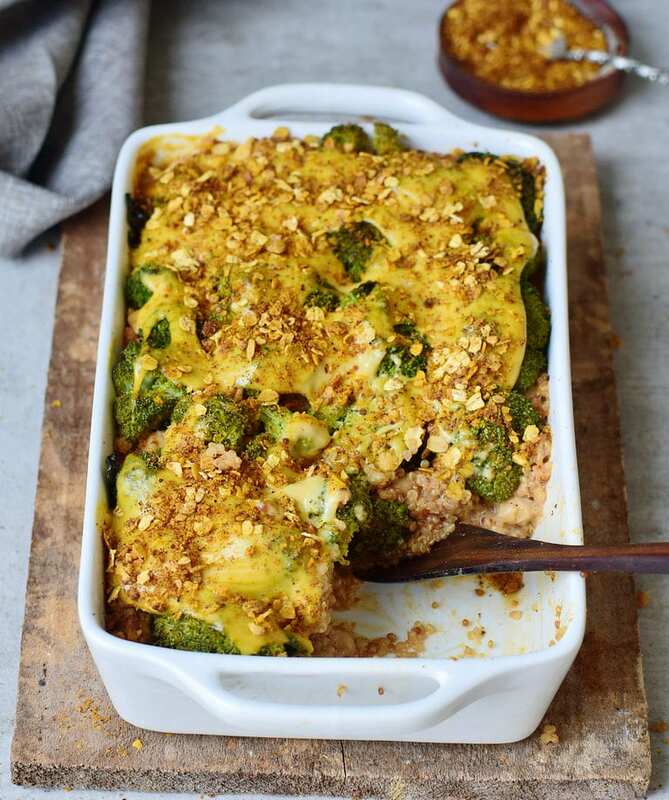 Healthy broccoli quinoa casserole recipe! A delicious soufflé which is vegan, gluten-free, grain-free, easy to make and ready in less than 45 minutes. 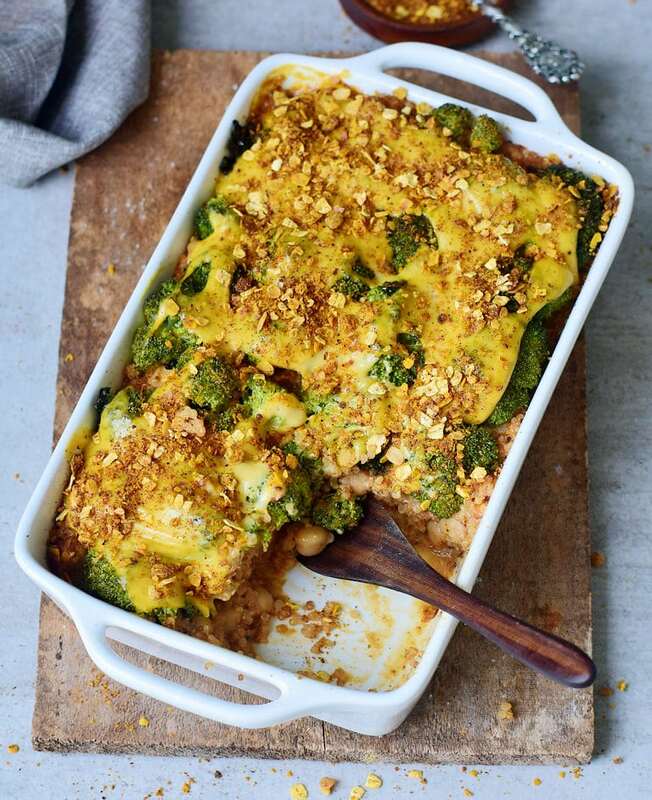 This broccoli bake contains many vitamins and minerals, as well as healthy carbohydrates, proteins, and fats. Ready to up your dinner game?! I thought it was time to publish a recipe with quinoa on my blog. Until today, I’ve created some tasty vegan recipes with rice, potatoes, and pasta. However, in my opinion, quinoa deserves to be used more often. This pseudo-grain is very healthy, delicious and protein-rich, furthermore, it’s not a real grain. Quinoa is also gluten-free and can, therefore, be eaten by people suffering from celiac disease. I also love the fact that quinoa contains plenty of healthy, plant-based protein. Since I adore casseroles, I decided to make a broccoli quinoa casserole with vegan cheese. This savory broccoli soufflé can be prepared in less than 45 minutes and it tastes amazing. Especially in the evening, when you want to enjoy a hearty comfort meal, there is nothing better than a cheesy broccoli casserole. Don’t you think so? Of course, you can also prepare this easy broccoli casserole with rice instead of quinoa. So if you don’t have quinoa in your pantry or doesn’t like the taste of it, no problem! You can just cook rice and use it instead of quinoa in the recipe. I am sure a broccoli rice casserole will taste delicious as well! 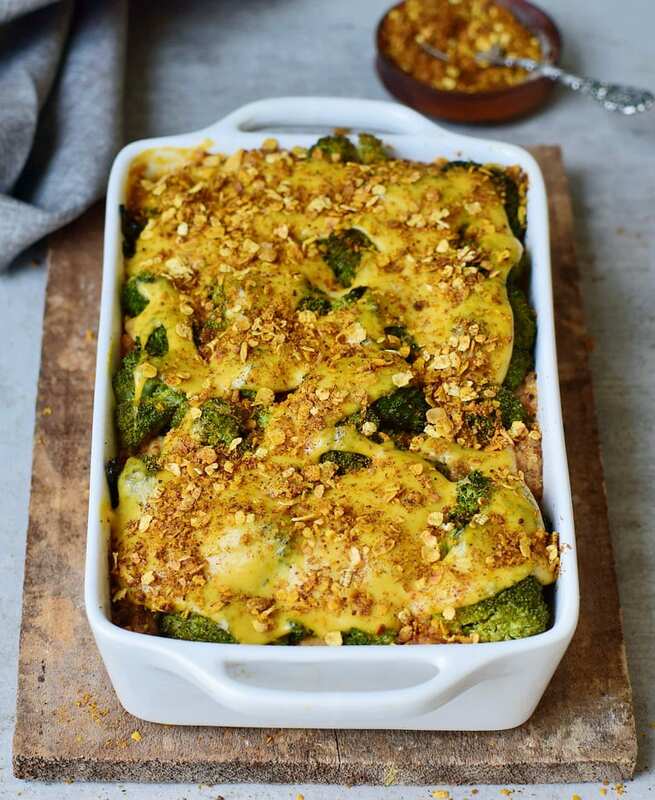 Another alternative would be to use potatoes to enjoy a delicious broccoli potato gratin! Instead of cheddar, I used my easy vegan cheese sauce because it only takes 3 minutes to prepare it. Of course, you can also use store-bought cheese from the supermarket. You can make this quinoa broccoli casserole with any kind of plant-based milk. For example, you could use almond milk, oat milk, cashew milk, coconut milk, etc., depending on your taste. The higher the fat content of the milk, the better the casserole will taste! In addition, I also added chickpeas, because they are another great source of plant-based protein and taste very delicious! I topped the broccoli quinoa bake with homemade “breadcrumbs“. The ingredients are oats, nutritional yeast flakes, and a few spices. In my opinion, breadcrumbs make a gratin even more delicious. 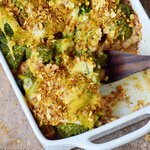 How To Make A Broccoli Quinoa Casserole? It really isn’t complicated to make this cheesy broccoli casserole. First, prepare the quinoa by rinsing it under running water for about a minute. Then cook the quinoa in salted water or vegetable broth for about 15 to 20 minutes. Meanwhile, you can already roast the broccoli in the oven. Once both quinoa and broccoli are done, mix the quinoa with plant-based milk, chickpeas, vegan cheese, and spices. Pour the quinoa mixture into a greased casserole dish, add the roasted broccoli. Finally, put vegan cheese and breadcrumbs on top of the broccoli, and bake the gratin in the oven for about 20 minutes. 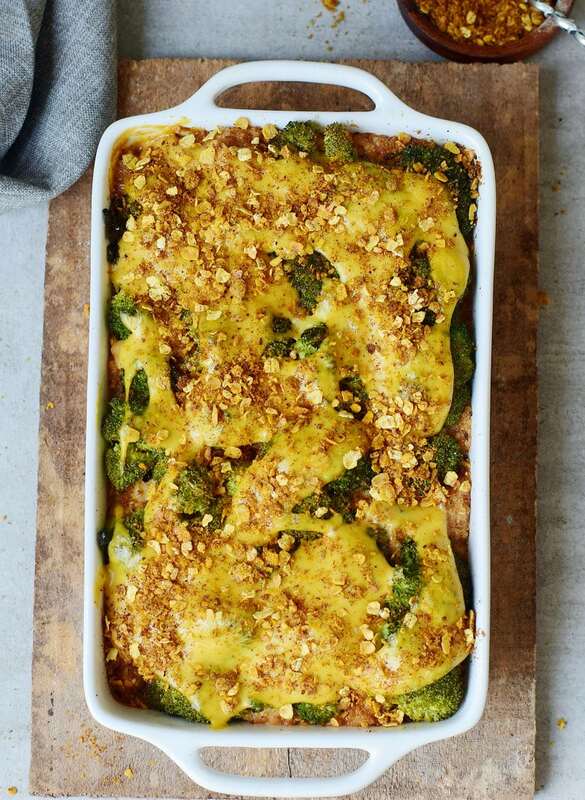 This broccoli bake tastes best when it’s still warm. You can put leftovers in the refrigerator and enjoy them either cold the next day, or reheat in the microwave or in the oven. It is also possible to freeze leftovers in zip-lock bags. Simply defrost at room temperature or in the fridge and reheat either in the oven or in the microwave. 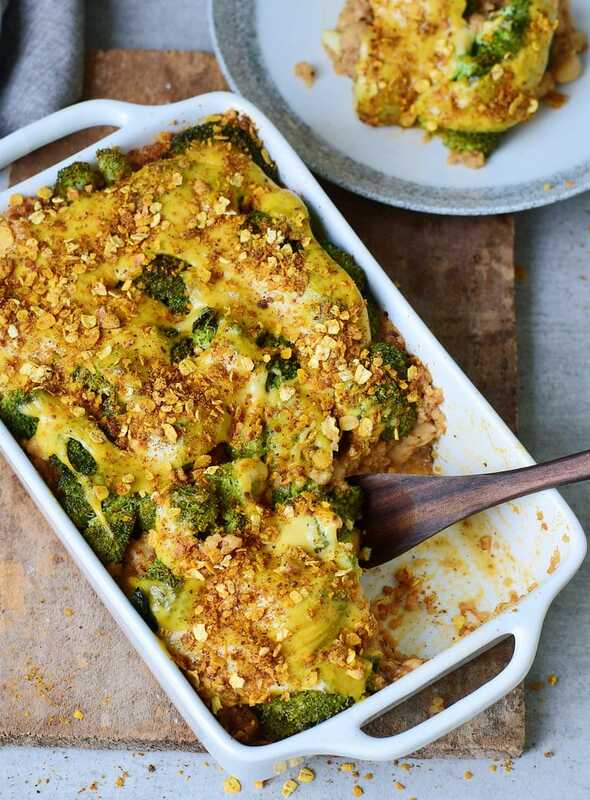 Should you recreate this creamy broccoli quinoa casserole, please leave a comment below and don’t forget to tag me in your Instagram or Facebook post with @elavegan and #elavegan because I love to see how your broccoli gratin turned out! 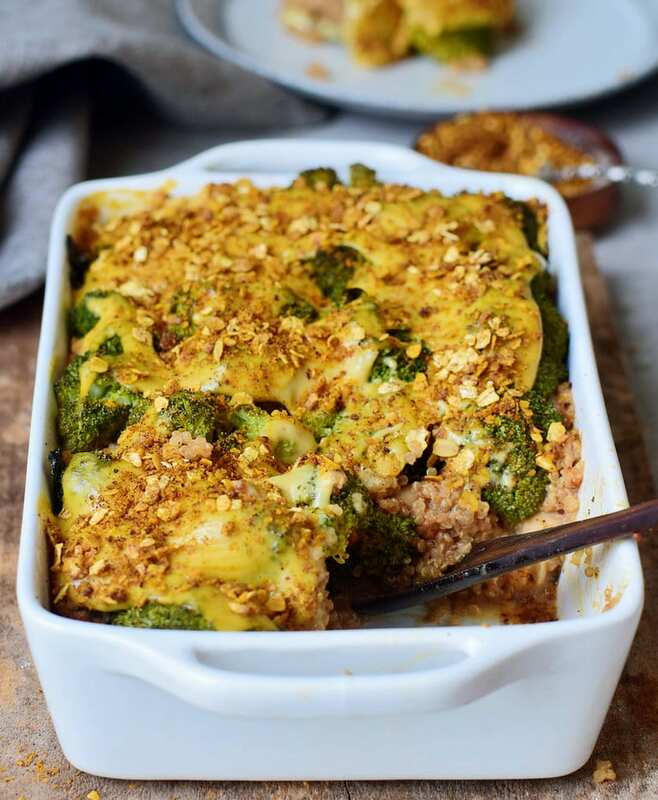 Healthy broccoli quinoa casserole which is vegan, gluten-free, grain-free and easy to make. 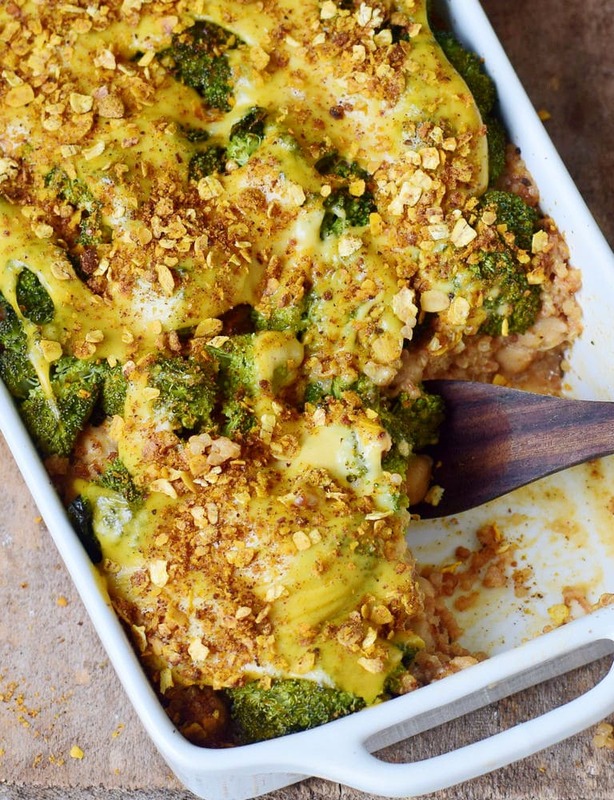 This creamy cheesy broccoli bake is perfect for dinner, especially on weekends. Bring a pot with 2 cups of salt water or vegetable broth to a boil and preheat oven to 400 degrees Fahrenheit (200 degrees Celsius). Rinse quinoa thoroughly under running water and put it into the water/broth as soon as it boils. Simmer for 15-20 minutes until no water is left and the quinoa is cooked. Cut the broccoli into florets, spread on a baking tray (lined with parchment paper) and drizzle with 1 tablespoon oil and a little salt. Toss with your hands and bake the broccoli in the oven for about 15 minutes. Meanwhile, prepare the vegan cheese sauce according to this recipe (CLICK). Skip this step if you use store-bought cheese). Put all ingredients for the "breadcrumbs" (except the oil) into a small bowl and stir with a spoon. Heat the oil in a saucepan over medium heat, add "breadcrumbs" and fry on low/medium heat for about 30-60 seconds. Add 1 cup of dairy-free milk, the spice mixture, the chickpeas and half of the cheese sauce (or store-bought cheese) to the quinoa and stir. Transfer the quinoa mixture into a lightly greased casserole dish, add the broccoli florets and spread the rest of the cheese on top. Sprinkle with the "breadcrumbs". Reduce the heat of the oven to 350 degrees Fahrenheit (180 degrees Celsius) and bake the casserole for about 15-20 minutes. Enjoy! This was delicious, a really warming & comforting meal. I substituted wild rice for quinoa as I had none left and it was delicious. Just shows how adaptable this meal is!! Made this last night! So easy! So good! This will definitely become a regular staple in our home! Keep the yummy recipes coming! This looks delicious! I was wondering if it’s possinle to substitute the quinoa for rice? Some people in my house aren’t quinoa fans lol. Just kidding! Just saw what you wrote in about rice. what a great way to use quinoa! Your casserole looks so delicious Ela! Is it 1 cup cooked or uncooked quinoa? This looks amazing!! If I used real cheese, do you recommend a block or shredded? Saw this recipe and since I had all the ingredients at home I just HAD to try it right away. Super easy to make and so so so very delicious! This dish is beautiful well executed bold flavor packed with protein. Also kid friendly my entire family loved this dish 100% will be making this beauty again thanks so much!! It looks amazing Ela! Such a great combo 🙂 I think I’ll have to try another recipe with quinoa soon. Broccoli and quinoa is such a great combo together! Husband and I loved this dish, however, mine did not have as much cheese as your pic displays. Since I’m on WW and need to watch my points, I used light coconut milk and would leave off the oat/oil topping. I don’t think it added much and would have cut the points down for me.Otherwise, as my husband said, “it’s a keeper”. My partner tells me this is her new favourite dish, and that is before we try the gumbo tomorrow!